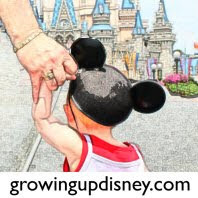 Growing Up Disney: Photo Flashback - You've come a long way! In December 1973 DisneyDad and his new bride visited Walt Disney World on their honeymoon. Yesterday (December 14) was our 37th Wedding Anniversary. This year marks 37 years of my wife and I coming to WDW. The family has come a long way from just the two of us in 1973 to 2 children, a son-in-law, a granddaughter, and one more grandchild on the way. Below is a picture of our Family from Chef Mickey's on Tink's first birthday in April. LOVE! I hope they had and will many years together! congrats on a long, fruitful and happy marriage! may you have many more years of joy and memories together!